Sanford, Florida brings forth vivid images of Trevon to most of us – Images of hatred, intolerance and separate worlds. 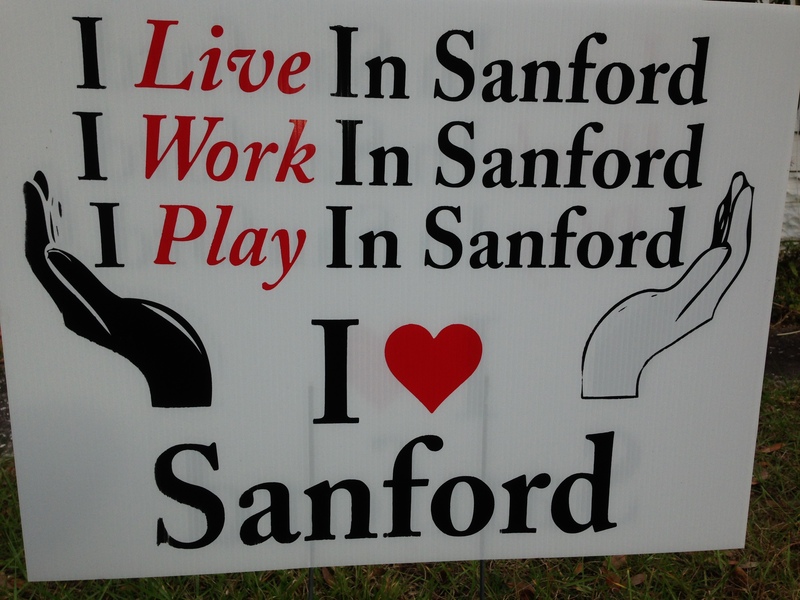 This is both unfortunate and ironic, since for decades, Sanford has been a microcosm of middle-America in the South. Black and white can work, and despite the headlines, it usually does. Most families have memories of holiday get-togethers that didn’t go well. Ok, typically alcohol was involved. It’s frustrating and painful because its family, but much funnier when it involves a spouse’s family. My brother-in-law is considered a “rascal” for reasons and stories that aren’t my business or relevant to this post, except that he and my other brother-in-law had “words” again, this year involving Sanford. Donnie loves Sanford, FL for lots of reasons. There is so much tradition – historical houses with Spanish moss, famous persons, and family lineage. Jeff asked what seemed like an innocent enough question regarding “gentrification” of the neighborhood, basically the changing socio-economic evolution (and property values) of the historical. and surrounding neighborhoods, and how the whole Trevon Martin thing had affected everything. Donnie got all upset, thinking there was an implication that he should move the family the hell out of there if the neighborhood wasn’t “improving.” There were really, really bad neighborhoods (the ‘hood) just a few blocks away, and the folks often stepped outside to get a breath of fresh air. He replied with something I never expected, but frankly I never really wondered why he lived here. “Jeff,” Donnie addressed him tersely, “This is all part of the package; we live in the community, and we’re part of it. We love Sanford, and embrace her with all her faults.” Jeff was simply stunned that someone would live here by choice, regardless of how cool the vintage house is or how many wonderful friends he had, black and white. Now don’t get me wrong, Donnie isn’t some “flaming liberal,” or someone who ignores common sense to make a statement. He and I are both just to the right of Ronald Reagan on most issues, but only “tow the line” when it’s logical, moral, and practical. For example, I do drive a Prius, but not because I really am convinced that hydrocarbons have changed our climate, and so I want everyone to see me shouting about it. I traded my Jeep for my Prius, because I drive 94 miles each direction, and frankly, have already paid for it twice in four years worth of commuting gas saved. Donnie’s the best joke teller I know, and his repertoire includes many of “color,” complete with colloquial expressions and accents. Never mean spirited, his jokes typically include Sheniqua, but if she heard them, she too would laugh. (Alternatively, they may include Lars and Yan, Norwegian farmers in Meenasoda). Anyway, so I did a double take to hear him preach about what it takes for us to get along and actually function with cultural diversity. So, I was struck by Donnie’s realistic altruism, a kind of pragmatic open-mindedness. This, though, is the love that makes the world go round. It’s one thing to say you are tolerant, something entirely different to actively seek a world with tolerance. Still thinking to myself, “Hmmm…,” I left the next morning for a training walk. (I haven’t officially announced it yet, but I’m counting the weeks until my next adventure, one that may begin to define how I commemorate my darkest day, May 17th). About an hour into my hike, I found myself walking along railroad tracks, a little bit lost, listening (of course) to Audrey Assad, Matt Maher, Sarah Kroger, Brandon Heath, and Chris Tomlin in a playlist shuffle that had me deep into thought (who would have guessed?) Technology to the rescue! IPhone out, MapMyHike Ap opened, and there was the route I had been travelling – not lost at all! I soon saw a sign announcing that I had wandered into “Washington Heights,” looking like a typical middle income suburbia. It wasn’t gated, but was laid out with predictable cul-de-sac’s and dead end streets that had me passing many houses twice, coming and going. As I put two and two together, I passed a “Neighborhood Watch” sign and began to actually notice that all my new friends were black. The irony was haunting, the previous day’s conversation about a community with diversity that actually functions, how that process may well be forever tainted or even ruined after Trevon Martin, a guy from out-of-town (me) walking through a neighborhood which is clearly not my own, now looking up at a Neighborhood Watch sign. The only thing missing was the hoodie. Or maybe not if the hoodie was a metaphor for some form of dress code inconsistent with the locals. I wasn’t exactly dressed like Ron Burgundy (Anchorman), but in my T-Shirt and plaid jeans, and my dorky walk and mannerisms, I certainly appeared as out-of-place as Treyvon did. Ok, in all fairness to Martinez, my “hoodie” didn’t make me look threatening, or hide my identity, and there hadn’t been months of criminal activity by someone dressed like me. So, fair or not, I wasn’t tailed by a “watch commander,” and the cops that were parked in the driveways actually waved back at me. I forced myself to overcome the urge to cross-over to the other side of the street when I approached a group of teenagers, nodding and uttering what I thought would be an appropriate greeting, “Sup?” After all, I was in their home and uninvited, but never once felt in danger. Admittedly, this was not the ‘hood that was previously mentioned, but simply another middle class neighborhood in suburbia. There were crime-watches because they don’t want crime in their neighborhood either! I switched my playlist over to the soundtrack from “The Way,” because this was feeling more and more like another leg of my Camino de Santiago. I’ve learned that we’re always walking on our journey, and its up to us to learn those lessons our Lord puts in front of us everyday. This was one of the humbling days, and my embarrassment profound as I realized how surprised I was to discover these people really were my brothers. I might have needed to travel to Haiti to recognize my that those who lived quite differently than I do are my brothers, but I shouldn’t have to go anywhere to recognize my brothers here at home. Indeed, “these people” are just like us. Better, in fact, in many ways. Every one of the little children, playing on the sidewalks and in the streets looked me strait in the eyes and waved and responded when I said, Hi,” or “Merry Christmas.” Would that be the case towards a black man in my own neighborhood? I had spent almost an hour hiking up and down every street in Washinton heights, and headed out, towards my own Christmas dinner with the fam. Two blocks further, and I started getting hustled by a few teenage kids, anxious to provide whatever it was that I “was looking for.” Why else would this goofy looking old white guy be walking around through this part of town? I just smiled, knowing sometimes the best finds aren’t looked for, but rather stumbled upon. Many times when we stumble, we fall. We naturally avoid those uncomfortable events and unfamiliar places to avoid the anxious tension that makes us squirm. And so, as we lose our balance or realize we’re a bit lost, we often so focus on keeping upright and not falling, we miss the sunrise and the blooming flowers. I’ve done this most of my life. A few blocks further I again smiled as I declined another kind offer to get ‘something’ for me. “Thanks, bro,” I replied, “I’m good.” I was now in “the hood,” and realizing why I had seen so many “Neighborhood Watch” signs during my walkabout in Washington Heights. Soon I left the classroom of this unplanned social experiment. Guess I was gone longer than I had planned, so I’d better gather some ammo as an excuse for not helping prepare for the 25 guests due to arrive in a few hours. Then I realized I’d been walking for two hours, and knew they’d be concerned, and wondering where I had been. But as I opened the door I simply slipped in and started frying bacon for the brussel sprouts topping. As I turned the sizzling rashers, I thought of the Christmas the families on the other side of town were having, and I looked around at my own, and smiled again.